The multi award winning Babyzen YOYO stroller is worldwide famous for its easy, instant one handed fold and unfold and compact overhead cabin luggage size. We are excited to announce that the new YOYO+ has just been launched and gives you all the benefits of the previous design but can now also be used with a car seat as well, making it a full travel system. The YOYO is the smallest folding buggy in the world and the only buggy to fully comply with size recommendation for cabin baggage. Perfect for urban parents and fantastic for globetrotters! Weighing just 6kg, this unique buggy is the most compact buggy ever imagined (52 x 44 x 18 cm when folded). The featherweight buggy has a one of a kind folding mechanism which allows it to be opened and folded in seconds with just one hand and it can then be carried over your shoulder with the detachable shoulder strap. The stylish stroller can be used from birth as a rear-facing stroller, with a pop-up canopy that can be adjusted to 3 positions, a foot cover and head support and a 5 point harness. 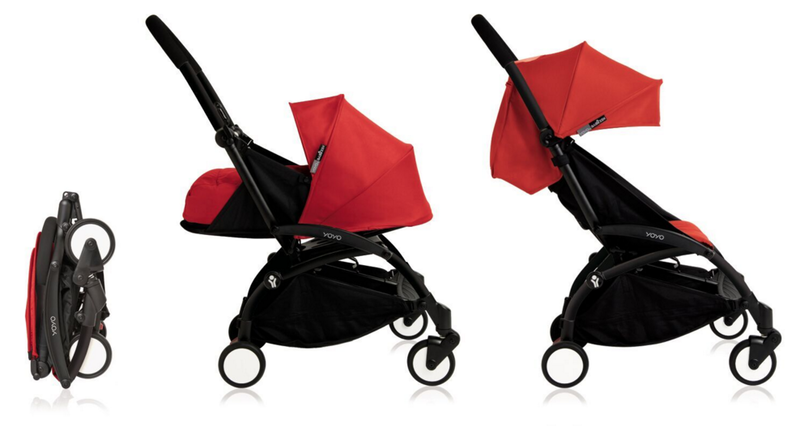 By removing the newborn nest and adding the 6+ pack (seat base and hood ), parents can convert the YOYO to an outward facing stroller with multi-position reclining seat. The BABYZEN YOYO+ car seat adaptors fit on all YOYO+ only and are for Maxi Cosi, BeSafe and Cybex car seats.